$200 Have it your way Giveaway Announcement!! BLOGGERS WANTED!!!!! Mia Mariu GIveaway Event Announcement!! BLOGGERS WANTED!!!! 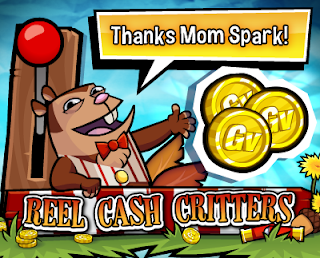 For this review I played Reel Cash Critters on Gamesville. and here is what I thought about it. I love slot games!! They are just great to me, they can become addicting and relaxing, which go hand in hand for me. So I played Reel Cash Critters today for the first time. At first it seemed slow somewhat. I wasn't winning that much so I then started to up my bet, the more I upped it the more I seemed to be winning. If I lowered my bet it seemed to lower the winnings right along with it. It had good sounds, but the one that I didn't like was when you won something, it made the sound but then it repeated it so at first I thought I was winning more every time it made the noise which wasn't the case. Well I was ready for the upcoming holidays!! WAS!! I am sick and have been since Sunday so being that I don't feel that great now, I wish that it was next week and not tomorrow!! At least my daughter knows how to do most of it and loves to cook and help so she will be doing more then w hat she's been doing. She won't mind, she loves helping in the kitchen but we just won't be doing alot of it together like we usually do. I don't know what's got a hold of me but goodness something sure has! The kids are out all this week, probably a good thing now being that I haven't been doing much of anything since its taken me over since Sunday! I hope that you all have a great Thanksgiving and enjoy the time that you have with family and friends. Were just going to be home just me and the kids. Vera Bradley Mandy Handbag & Turn Lock Wallet Giveaway!! Enter today! Welcome to the Vera Bradley Giveaway!Hosted and sponsored by Giveaway Promote. The busy holiday giveaway season has begun! Hey there everyone, if you love purses and wallets then what a better way to maybe win yourself or someone else a present for the upcoming holidays!! Enter today and make sure you enter all the times that you can to get your chance of winning increased!! First Hostess and now Elmo?? What in the world??! I heard about Hostess the other day..that is just sad...its really really heartbreaking to me because I remember those snacks being around for a very very long time and now for them to go out its just frustrating and hard to believe and what I feel for the most, is all the people that have put there lives in those companies and now won't have a steady job/income coming in and right before the holidays is just extra sad and heartbreaking. And then I heard today about Elmo..the voice of Elmo resigning because of whatever issues he has and I will leave it at that...that is just sad too because my kids who are now teens, grew up on Elmo and its sad to hear about something and someone that has been around for so many years resign. I can't imagine Elmo not being around and not too sure that they can ever replace his voice..I mean its just one of those voices that stuck and that's why he was Elmo for so long...goodness sad news to hear. Welcome to the Mobi GloMate Giveaway! About the GloMate: The Mobi TykeLights Portable GloMate is a unique and kid-friendly children's nightlight. With 5 different color modes, your child is sure to love the rechargable and portable GloMate. Not only is the GloMate BPA and Lead Free, Safety Tested and Certified, it is powered by heat-free LEDs, meaning it stays cool to the touch. Find more information and read the full Mobi TykeLights Portable GloMate Review. One lucky winner will be receive one Mobi TykeLights Portable GloMate.Enter the giveaway using the form below. Good luck!